Topps released a sneak peek at its baseball flagship for 2011, the company’s diamond anniversary. 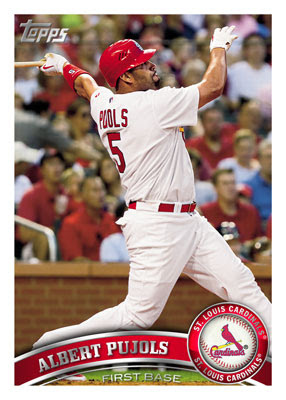 The Albert Pujols card was released on Topps’ Twitter account. I’ll tell you right now, I’m a fan of this design. It’s clean and crisp and best of all, I think the photography on this card is great. If only the low end topps designers gave hints to the high end guys. Their low end = so much win, high end = so much fail. I would agree with that. 2011 should be interesting. Topps made a big deal out of their diamond anniversary at the national. I'm assuming there's a white border on that thing? I just saw another report that said it was a full-bleed photo design. I want to see Saltilamachia's name on that card. agreed photo is good - I will have to see more cards before I can form an opinion on the design. I for one don't like it ... it looks as if it belongs nestled in with the rest of those godawful early 1990's topps set designs. I'm all for it, IF those gradient shades of gray aren't foil. I like it. It's way better than this year's design. 2010 just looks cheap and I can't believe they used it for football and WWE too (insert #fail hash tag here). 2011 looks classy though, aside from the border. But that's always a problem, so w/e. not crazy about the gradients and the typeface on the Player Name.. but not bad. Night owl, my understanding is that there is a white border. That was the image that Topps tweeted. I didn't make any adjustments to it. I agree that this design is far better than 2010's. I don't hate foil stamping, but it would be nice if Topps were to buck the trend and leave the foil off with this release. It looks like I'll be building the base Topps set for a 4th consecutive year now. My first impression, I don't like it. Maybe it will grow on me, but I can just see all the silver shinies and the stacks sticking together after a week, and I just don't like it. I like the action photography and the fact I did not see any air brushing. At least I don't think I saw any. Correct me if I am wrong. I'd rather have a great action on card rather than a player cheese for the camera. Robbie or Josh: Who wins?